With the expansive coastline and islands, Italy offers multiple options for sailing and motor yacht charters. Each area has its own richness in magnificent scenery, art, culture, history and delectable cuisine. Even locals will agree Italy is best approached by the sea. The common charter regions are; Italian Riviera, Tuscany, Amalfi Coast, Sardinia and Sicily. The Italian coast attracts luxury yacht charters of high standards so you will be sure to enjoy the best of Italy in style. Take in the breathtaking scenery, historical sites and the revelry of the Italian lifestyle away from the crowds. 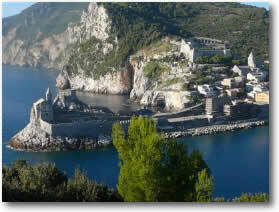 Italy’s dramatic coasts and heritage can only be truly appreciated from a yacht. The character of the distinct sailing regions of Italy are outlined below. Each deserves at least a week of exploration. The Northwest coastal regions of Liguria and Tuscany is an exceptional coastal region that will give you the true essence of the Italian concept of living life on the edge yet with all the pleasures deserved. Be a part of the International “Jet-Set” community in Genoa and the Italian Riviera. While the French Riviera is popular, Italy’s Liguria Coast bordering France, has been touted as the “Italian Riviera” where you can sail your yacht into adorable towns frequented by the rich and famous. You may board in Genoa, birthplace of Christopher Columbus, and venture to the delightful towns of Santa Margherita Ligure, Sestri Levante and little changed Portofino, the Italian Riviera’s best-loved posh town, declared in 1935 to be a national monument. As you sail on down the coast, breath deep the aroma of olive trees, parasol pines, vineyards and pesto. 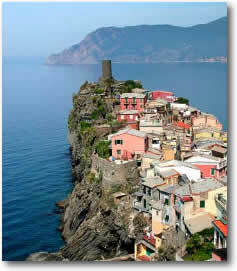 Continue to Cinque Terre where you can only go by foot, train or boat, between five charming villages frozen in time. You may end your charter here or enjoy Tuscany. The Tuscan archipelago is comprised of seven idyllic islands. Elba is the most popular tourist destination. Montecristo, on the other hand, allows only a 100 people on the island per day. That is truly a privilege for the yacht charterer, who at the very least can cruise by this secluded and magnificent protected island. Car access the these areas, is either impossible or extremely difficult with traffic, parking and car sickness from the twists and turns of hair raising roads. You will be thrilled to arrive by boat! The prevailing summer wind is West to Northwest. Southeasterly winds are common around the mainland coast, along with frequent periods of calm. At night there is frequently light Westerly or Southwesterly wind, making for comfortable anchoring. There may be passing squalls In the Spring and Fall. Sicily is the ideal destination from which to embark on a charter rich in history and natural beauty with its imposing coastline and Etna’s towering volcanic peak. Exotic plants and luxuriant gardens abound in the semi-tropical landscape of lemon groves and pine forests. Highlights of a yacht charter in Sicily will include: impressive monuments of the past set against spectacular natural backgrounds. With its mild climate and volcanic enriched soil, Sicily offers an abundance of vegetables and citrus fruit, including the famous blood o ranges, and produces olive oil and wine. The local cuisine is mouth watering whether prepared by your charter chef or at the wonderful restaurants. 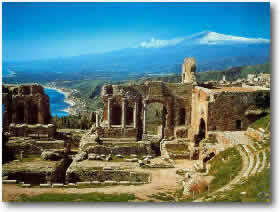 Located approximately 35 miles from the coast of Sicily are the Aeolian Islands, which are protected by UNESCO. Each island is the peak of a volcano and two are still active. 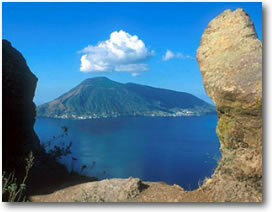 You will not be disappointed by the astonishing natural beauty of the Aeolian Islands. The islands have harbors and anchorages protected from the prevailing northwesterly winds. Occasionally there are gusty days blowing over 25 knots. This special cruising area combines the flavors of Italy and France. If you are planning a charter to Corsica consider starting in Sardinia to take advantage of French and Italian flavors. You will inevitably find the experience deeply rewarding. Sardinia is a place truly unto itself. With its very special striking landscapes, history, food and culture, Sardinia is not your typical Italian destination in that the climate is not as hot as the rest of the Mediterranean. Breezes 10 – 15 knots from the northwest make for some wonderful sailing. Sardinia has become a hot spot with many mega yachts competing for berths in Porto Cervo and other glamorous ports in summer. Sardinia also offers less frequented stunning ports and bays. The “Emerald Coast” in the North is famous for its gorgeous beaches, radiant blue water and rugged cliffs. This is an excellent base from which to explore the very famous Maddalena islands on the way up to the French island of Corsica. The bustling Naples region is the perfect starting point to enjoyable cruising both on the mainland and to nearby islands. In contrast to Tuscany, the usual itineraries offer shorter more relaxed sails and highlight beaches, glamorous cities and nightlife. From the endearing chaos of Naples you can sail quickly to the Isle of Capri or along the beautiful Amalfi Coast. Gems of this cruising area include the archaeological site of Pompeii, the Blue Lagoon on Capri, the spectacular volcanic island of Ischia and the prestigious resorts of the Amalfi coast such as Positano, Amalfi and Ravello. 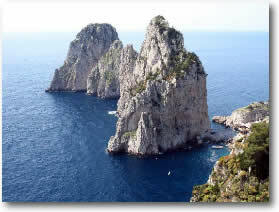 It you desire to see and be seen in glamorous style, the area will be a thrill, and Capri in particular. It is packed in the summer with hundreds of yachts, each one bigger than the next. A crewed yacht charter is most desirable as yacht berths are generally reserved well ahead of time on your behalf. You will hear from anyone that has experience, that the only way to truly appreciate the stunning beauty of the Amalfi is to approach from the sea.